The manufacturer claims it is the lightest forged head in the world. I have no way of proving or disporving that. But one of the ways in which it achieves lightness is by using a lighter B-rated shaft that trims the ounces. In fact the Air Tech Racing comes in at just shy of 400 grams (14.1 ounces) compred with the ordinary Air Tech at 475 grams (16.8 ounces). The Air Tech Evolution is also in the higher weight category. 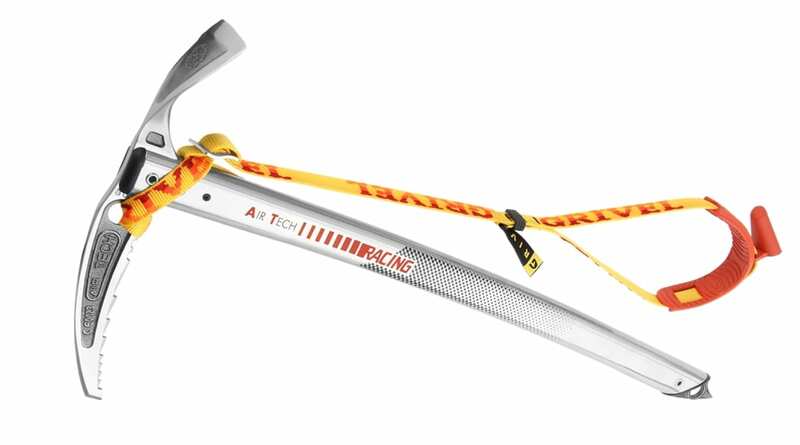 This ice axe gets rave reviews from its users who praise its lightness and its strength. The great thing about it is that it clocks the scales at very little yet is still fully functional and it doesn’t feel as if it has been cut down too much the way the Black Diamond Raven Ultra sometimes does (the Ultra doesn’t have a proper spike so isn’t as great for walking) or the Camp Corsa (with its aluminium head, tiny ity bity adze and no spike). In short this is a great axe for general mountaineering, ski touring and climbing moderate to steep snow. Its head and adze will get you over a hump if you need them for the occasional bit of slightly steeper climbing. Cons: The only downside to this is the price. You will end up paying a bit more for it than some other ice axes. But the choice is yours you can have strong, cheap or light – pick the two you want most. If strong and light are your choices then this is a good pick for you. If money is an issue look at the Raven Pro. Here is a bit more on the Grivel lineup of crampons and iceaxes.